Induced polarization (IP) imaging is a geophysical imaging technique that geoscientists and engineers use to identify various materials beneath the earth’s surface. It is similar to electrical resistivity tomography (ERT) in that both methods induce electric currents into a subsurface through electrodes. Scientists and engineers monitor the voltage through additional electrodes. There are two basic methods of induced polarization: time domain and frequency domain. Time domain IP imaging measures electric chargeability over a specific period of time after the removal of induced voltage from a subsurface. The frequency domain method uses alternating currents (AC) to induce electric charges into a subsurface. It measures electrical resistivity at different frequencies. Geophysical imaging is based on applied physics, which has practical and technological applications. It connects “pure” physics with engineering. In addition to induced polarization and electrical resistivity tomography, geophysical imaging includes ground-penetrating radar (GPR), seismic tomography and seismic reflection. Induced polarization and other imaging methods have numerous applications. Engineers and geoscientists rely on these systems for archeological surveys, cave detection, construction site investigations, dam leakage investigations, environmental surveys, groundwater exploration, marine exploration, mapping and other uses. Construction companies use IP and ERT systems to characterize sites for development. Oil and gas companies use them to investigate sites for horizontal drilling and tunneling operations. 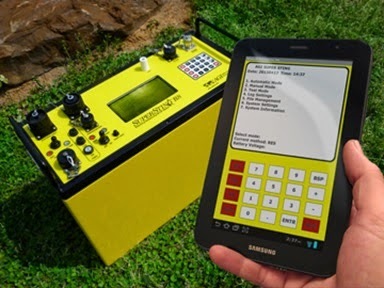 Electrical resistivity meters are especially valuable in locations where GPR and other methods cannot easily locate and record subsurface materials. Clay areas are a common example. Advanced Geosciences, Inc. (AGI) is an example of a company that manufactures geophysical imaging systems. Such high-tech companies make some of the most advanced resistivity and IP meters in the world. A team of geoscientists, engineers, computer programmers and technicians work together to develop hardware and software for these systems. As manufacturers, companies like AGI have no desire to compete with their customers. Therefore, they do not perform electrical resistivity surveys. However, most of them offer services like resistivity data processing, geophysical imaging seminars, consulting services and technical support. Customers and interested individuals can learn more at AGIUSA.com and similar sites on the World Wide Web.